Food plots - you hear about them often for deer hunting. You likely even plant them – or have planted them – yourself for your fall deer hunts. But do you plant them with turkeys in mind? If not, it may be a good idea, but there are some things to keep in mind when deciding on where – and what – to plant your food plots if drawing turkeys in is your goal. A good place to set up a food plot is along the edge of a wooded area. Strutters love to get out in the open and strut their stuff for the ladies, and a food plot that lies adjacent to a wood lot would be ideal. There are other places that will work too, though, in case your property is lacking in the open terrain department. Clearings inside of woods are also good bets. A nice opening in a secluded spot inside the timber is just the ticket for drawing in birds. 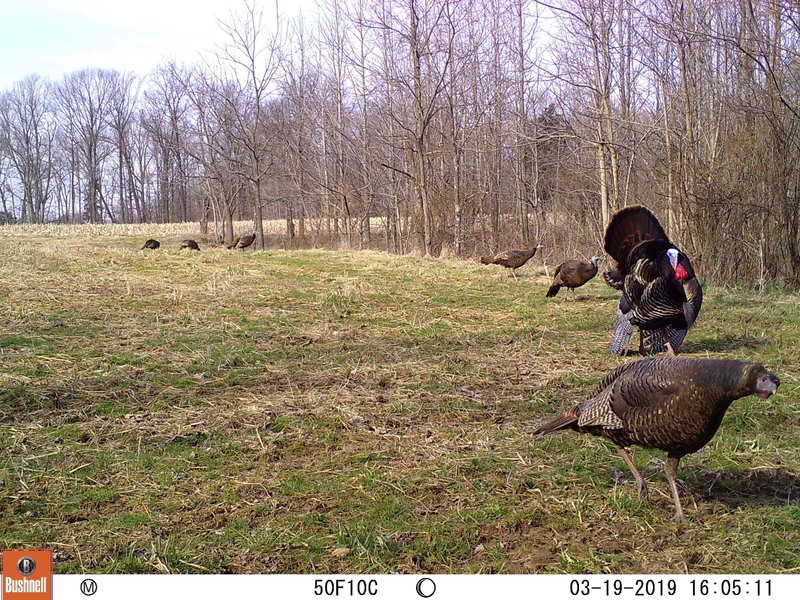 These areas tend to naturally attract turkeys anyway as they allow sunlight in, let a tom strut with some visibility, yet are close to safety and are perfect dusting and scratching locations. Putting a food plot in such an area that already attracts birds is a slam dunk. When making a food plot for turkeys, keep one thing in mind; think long and narrow. Make it a place that a tom will want to strut in. If he wants to strut in it, he will be there for a while, hopefully drawing in more turkeys. Don’t have time or money to make a food plot for this spring? No problem. Sometimes just disking up or clearing out an area may be all you need to do. While it certainly will not have the drawing power that an actual food plot will, it will open up an area and allow for some weed growth, which will in turn provide the birds in your area a place to dust, scratch, and strut. Such an area will also allow weed growth, attracting bugsThere are several foods that make for great planting in food plots, that will both attract turkeys and offer them the right kind of food that they require for nutrients and nesting. Luckily, if you had food plots planted for the deer on your place, then these same plots will generally attract turkeys as well. If you want to amp up your bird game, however, there are certain types of things to plant that can be even better at attracting birds. Some drooping or plowed under corn from last fall is a great food source for turkeys, it provides plenty of calories and nutrients, but typically isn’t the first thing you think of when planning plots. If there is a no-till corn field in your hunting area, you may not want to plant corn as a food plot, but might want to consider planting a plot close by as a place to offer them a variety of food plus some other vegetation that will attract bugs, which are high in protein and a staple of a turkey’s diet. Grains such as rye, oats, wheat and milo also make sense in your plot. Such forage is planted in the fall though, and the grains from these plants won’t become available until summer, however, they green-up early and, therefore, will still attract birds for strutting, dusting and scratching. They are small and provide just the nourishment turkeys need for summer and early fall though., which make up a huge part of a wild turkey’s diet. Clover and alfalfa are other top picks when considering what might make for a gobbler attractant. Chufa is, by far, the most popular turkey attractant, and for good reason: it is as close to a turkey “super food” as there is. According to the NWTF’s Scott Vance, “Chufa is a super food that contains about 36 percent essential, high-quality, edible oil which is used to fight against cardiovascular diseases.” The plant also produces tubers which turkeys just can’t seem to get enough of. It can be daunting when trying to incorporate food plots into your hunting area, considering such things as Ph levels, fertilizing, over seeding, when to plant, etc. For the everyday hunter, the bottom line is, don’t fret it too much. If there are patches of your plot that don’t come up, such areas will end up being perfect places for turkeys to dust and scratch for bugs anyway, so things will still work out. Food plots for turkeys are definitely a good idea, if for no other reason than they can help attract more birds to your property, which is always a good thing! Especially if you don’t already have birds roosting on the property you hunt, putting a food plot or two in could certainly change all of that. Besides the ability to attract birds onto your property, food plots will definitely give toms a place they like to strut, hens areas to nest, both sexes a place to dust and scratch and obviously, nutrition; all of which will help you put a bird in the hand, rather than two in the bush. Have you ever wished you knew how to kayak or wanted to try it out before buying your own? Join the Patoka Lake Interpretive Naturalists at the small craft launch for a beginners kayaking lesson on Saturday, April 13 at 1:00p.m. Eastern Time. During this lesson, participants will get to try several different styles of kayaks and paddles. Participants will learn what gear is needed and the best places to paddle on Patoka! All equipment including life jackets will be provided. This event is open to anyone ages 12 and up. Cost is $5 per person and space is limited to the first 50 people registered. Register by calling the Patoka Lake Nature Center at (812)685-2447. There will be a 3-D Broken Arrow Archery shoot Sunday April 14th at Beaver Lake CR 325 E Jasper IN. Sign-in will be from sunrise till noon. A practice range will be available, and concessions will also be sold. There are new lower prices for entry fees. The entry fee is $10 for all adults, $8 for children age 11-17, and free for the cub class (10 and younger) and active military members. From Jasper, take State Road 164 east to County Road 325 East, turn left and follow the road to the clubhouse on the right. For more information , call cliff fleck at (812)630-0454 or karla brames at 8128273756. The Graveyard Hunt Club will be holding a Youth Turkey Hunt April 20-21. Any interested youth can contact Quintin Myers at 812-486-5685. Youth will receive a Graveyard Gift pack. There will also be a gun give away, prizes for heaviest bird and longest beard. The awards banquet dinner will be held Monday, April 22 at 6 PM. Youth will be guided by Graveyard hunt club pro staff members. Youth hunters must have a valid license to take a wild turkey. The Indiana youth hunt license is $7 for youth 17 and younger. Hunters may use legal shotgun, bow and arrow or crossbow. Again for more information contact Quintin Myers at 812-486-5685 or Julie Chapman at 812-610-0097. The Rotary Club of Jasper will sponsor a Clay Shoot on April 26 at Cool Springs. You’re invited to take part in a fun day of shooting while raising money to keep our kids safe. Shoot from 12 stations with 100 sport clay targets. Ammunition if provided. Bring your own 12 or 20 gauge semi-automatic or over-under shotgun. Single shot or pumps are not recommended. Teams of 4 are recommended but not required. Registration begins at 8:30 AM with shooting to start at 9 AM EST. Lunch is provided. Purchase your tickets to participate on Eventbrite https://rotaryclubofjasperclayshoot.eventbrite.com. Ticket cost is $100 for individuals or $400 per team. Join in a women’s only event to learn outdoor skills in a relaxed environment on Friday, April 26 through Sunday April 28. This event will start at the Patoka Lake Nature Center and include overnight camping for the duration of the weekend. Women ages 16 and older can participate in activities including in depth archery lessons, kayaking, Dutch oven cooking, survival, wild edibles and medicine, wilderness 1 st aid, basic fishing, firearms safety, trap shooting, rifle, boat operations, self-defense, wildlife tracking, beginner birding and more. Meals will be provided on Saturday and Sunday. Camping will take place in the modern electric campgrounds. Pre-registration is required by April 10th . There is a registration fee of $65/participant. For more information or to register, call the Patoka Lake Nature Center at (812)685-2447. This event is being sponsored by the Dubois County Shooting Sports Instructor Council. The birds and the bees are active again and that can mean only one thing: baby animals. If you encounter a young animal, remember that adult animals rarely abandon their young. The adult may be out of sight gathering food. Leaving young unattended is normal for many species. Baby animals should not be handled. Though human scent may not cause parents to abandon their young, it can alert predators to the young animal’s presence. Indiana residents do not need a fishing license or a trout/salmon stamp to fish the state's public waters on Free Fishing Days. On all other days, only youth (age 17 and younger) and a few other special anglers are exempt from the license requirement. Free Fishing Days, April 20, May 18, June 1-2. State fish hatchery personnel are currently stocking rainbow trout for the 2019 season. Lake stockings began in mid-March and should be completed by mid-April. Streams throughout the state will be stocked later this month in preparation for the opener of the stream trout season on April 27. In order to protect these fish prior to the opener, certain streams are closed to all fishing from April 15 until opening day. Please see the fishing guide for more details. A fishing license and a trout and salmon stamp are required to fish for trout. The 2019 Spring Wild Turkey season begins April 24 and runs through May 12. Youth Spring Wild Turkey season is April 20–21. For licensing and regulations, check out the hunting guide. You can buy your license online or at your local retailer. The 2019 NRA Annual Meetings & Exhibits is coming back to the Indiana Convention Center in downtown Indianapolis April 26-28. Exhibit hall admission is free to NRA members and immediate family. There will be 15 acres of guns and gear, exclusive seminars and luncheons, appearances from top national political leaders and musical superstars including Alan Jackson with special guest William Michael Morgan. It’s a great chance to rub shoulders with tens of thousands of other Second Amendment patriots. Hours on Friday, April 26 and Saturday April 27 are from 9 AM – 6 PM and Sunday the 27 from 10-5. Call 877-672-7632 for tickets or visit www.nraam.org for more information.